COAHOMA - The Coahoma Bulldogettes (1-2) lost a heartbreaker to the Post Lady Antelopes Tuesday night as the game slipped away in the final minutes of the match. Post won 43-36. From the start, the two teams traded the lead throughout the tight-scoring game. Neither basketball squad could get more than a small advantage before the other caught up and pulled ahead. By the first quarter, Post had a slim 1-point cushion over the Coahoma squad, but by halftime the Bulldogettes headed to the locker room ahead by 2 (20-18). After returning for the second half, both teams continued the fight. At one point in the third quarter, the Bulldogettes looked as if they were close to breaking the stalemate when Abbie Lopez buried her shot with 3:23 left. That goal left Coahoma ahead by 4 (27-23). However, the Lady Antelopes surged back pulling within 1 to tie. Then Jovi Gonzales sank the ball into the net from behind the charity strip and Caitlyn Corley netted a field goal to leave the score at 30-26 Bulldogettes. Once again, Post pulled ahead by 1 point (31-32) in the fourth quarter, yet the Bulldogettes were not finished. 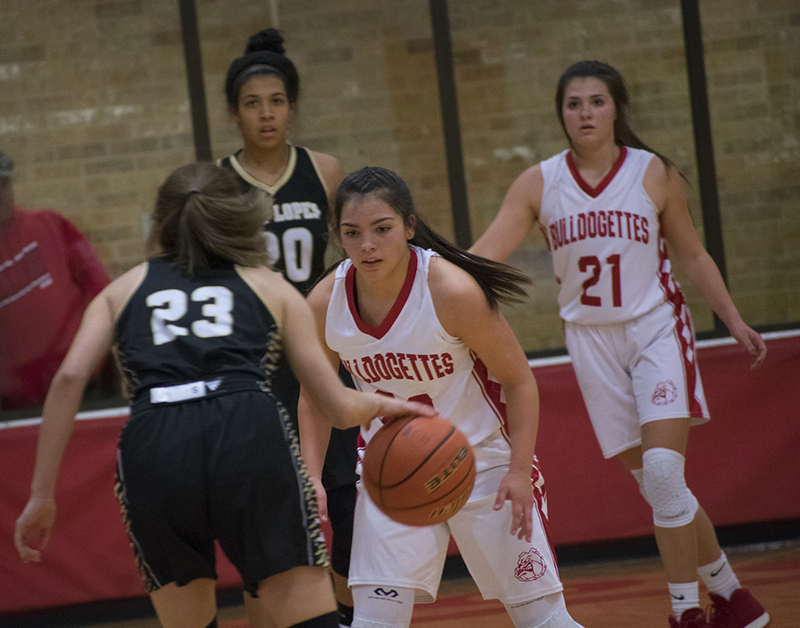 Kenzi Canales hit a 3-pointer as the clock ticked down to 5 minutes and Ashley Romero sank one of her two free throws to put the Bulldogettes up by 3 (35-32). Unfortunately for Coahoma, the momentum of the game switched back the Lady Antelopes who took full advantage to score 11 points and wrapped up the match. Corley had a game high of 12 points for the Bulldogettes. Teammates Romero and Canales were next with 6 and 5 respectively. Next: The Bulldogettes head to Forsan for the Tip Off Classic, held Thursday through Saturday. Coahoma is set to play Garden City (4-0) at 11:30 a.m. and then the Big Spring High School JV team at 4:30 p.m. Thursday. Coahoma: Caitlyn Corley, 12; Ashley Romero, 6; Kenzi Canales, 5; Abby Lopez, 4; Paige Atkins, 4; Jovi Gonzales, 3; Macee Grant, 1; Cassie Grant, 1. Post: M. Perez, 15; A. Jenkins, 8; S. Hernandez, 6; L. Turner, 5; K. Finch, 3; A. Moreno, 2; K Greathouse, 2; A. Gomez, 2. Coahoma - Madison Rogers had an outstanding night Tuesday netting 21 points for the JV Bulldogettes during their game against the Post Lady Antelopes. Coahoma lost the match 31-46. With the loss, the JV Bulldogettes fall 1-2 for the season.